programs that enhance self-esteem, self-worth, self-sufficiency, and long term success. CARRY addresses the painful skin conditions of at-risk or foster youth in the country. Our goal is to help children to experience a better way of life through our philanthropist care and effort. 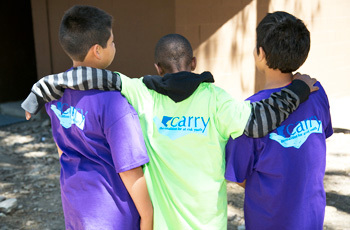 The CARRY foundation takes action when it comes to providing care to at-risk and foster-care children who are in need. CARRY offers multiple programs and activities centered on developing academic and general life skills. At-Risk Youth comprise a vast population of young people often residing in urban areas of the United States. Such youth have been described as being economically and socially disenfranchised and are generally defined as, by virtue of their circumstances, statistically more likely than others to fail. They often live in chronic poverty with negative peer influences, and possibly live in foster care. When the needs of these young people go unmet, their potential negative outcomes include: teenage pregnancy, criminal or antisocial behavior, poor academic performance, shorter lifespan, mental health problems, and unhealthy relationships. CARRY Is Making a Major and Positive Impact. We believe children are the future and to ensure it remains bright, we instill lessons that teach resilience, compassion, harmony, and giving. We aim to guide our youth towards a positive path that ensures a secure, safe, and productive future. Our cause serves to inspire others around the greater Los Angeles area.